Kambu or bajra is rich in various nutrients like protein, folate, potassium, copper, B-complex vitamin, zinc, calcium, and iron. Bajra is also rich in fiber and helps to maintain blood sugar levels (especially in diabetic people) and also heart health. 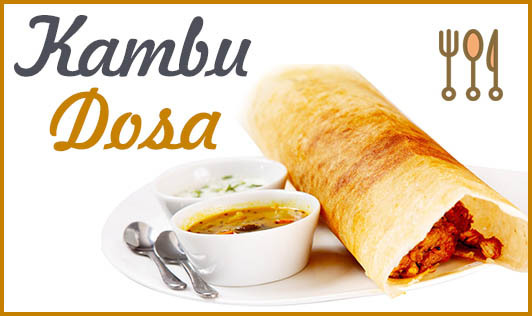 Kambu dosa is a unique way of including kambu in your diet. These dosas are not only crispy and tasty, but also nutritious. • Wash and soak bajra for 5 to 6 hours. • Wash and soak urad dal and methi together for 5 to 6 hours. • After soaking grind bajra first and while the bajra is coarse, add urad dal, and methi midway. Grind together to make a smooth batter. Use enough water while making the batter. • Transfer the batter to a container, add salt as required, and cover the container with a lid. • Place the batter in a warm place and let it ferment overnight. • The batter will double in size the next day; add a little water to make it runny so that it can be easy to spread on the tawa. • Heat a nonstick tawa and grease with a little oil. • Now add a ladle full of batter on the tawa and spread evenly in circular motions moving outwards. • Drizzle some oil on top of the dosa and cook until the dosa turns slightly brown. • Once brown, flip it over, and cook for a few more seconds. • Serve hot along with chutney or podi. • You can refrigerate the batter to use later. • You can use whole bajra too. • You can use an iron tawa too. • You can also add vegetables to the batter to make it more nutritious.